Three big lamb chops were not going to feed four people, no way, not with all of those big blobs and hard ribbons of fat running through the meat. How did I miss seeing that at the meat counter!? Okay, take a deep breath and move forward; switch to Plan B and deal with it. This was an opportunity to develop a new-to-me Lamb Chili recipe. 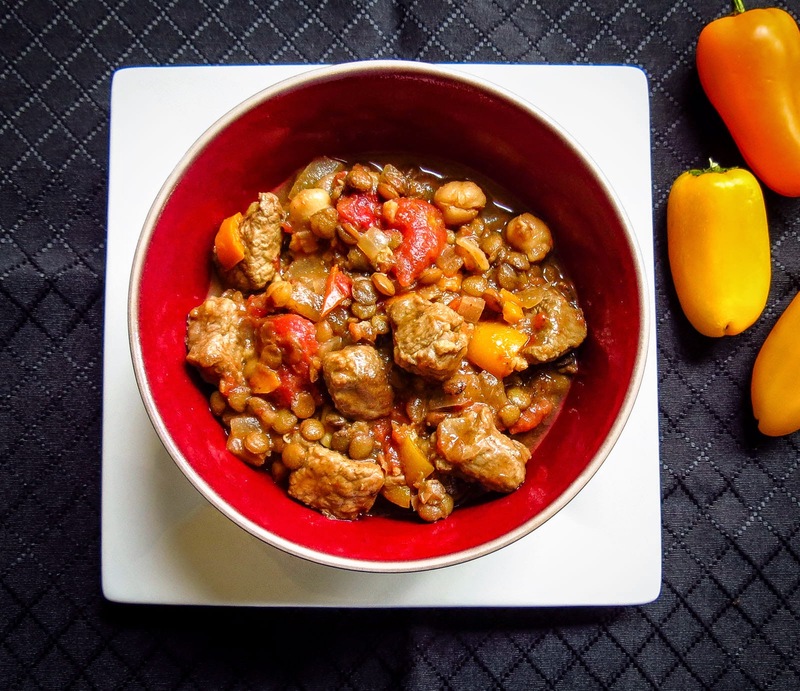 I have worked with scores of chili recipes over the years, familiar with the basic techniques and ingredients, but I don't often use lamb. Hmmm, what would make a lamb chili special? Lightbulb moment! Traveling through Washington State's Palouse country on a scenic winter road trip we sampled an awesome three-meat chili that featured lentils rather than beans (link). That was the inspiration, the beginning of this new favorite recipe. The chili went together quickly and easily; removing the fat from the lamb was the only annoying step. Like so many chilies, soups and stews the day-one serving was delicious, but on the following day this lamb chili was even better. 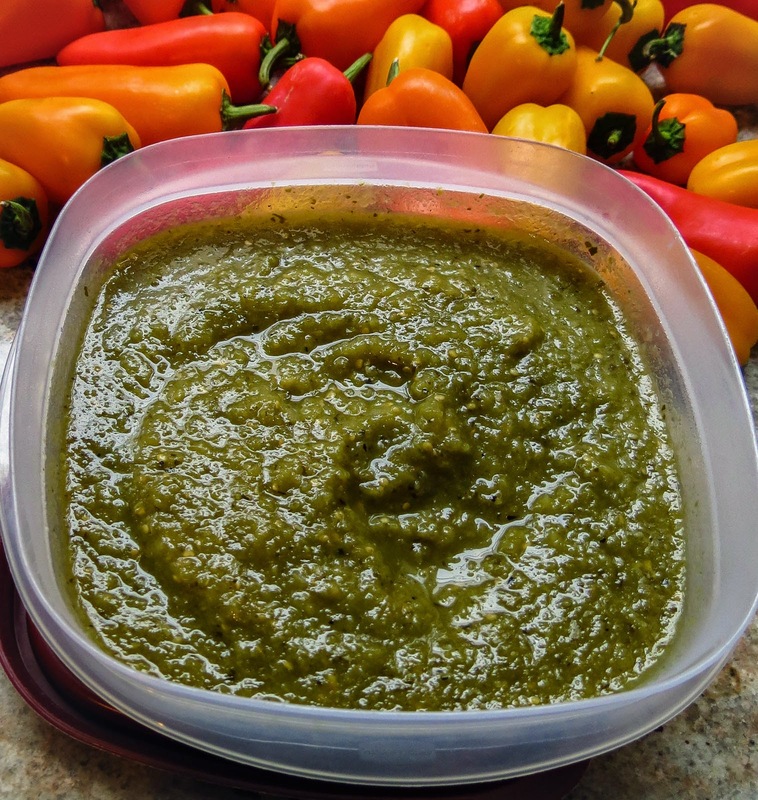 The flavors mellowed and mingled, the sweetness from the carrots balanced the bite of the fresh poblano and powdered ancho and chipotle seasonings. Lentils added a slightly nutty, earthy flavor and I tossed in a cup of garbanzo beans for a little more crunch. Lamb Chili with Lentils turned out to be a better choice than the grilled Lamb Kebabs I had originally planned. Serendipity, perhaps? Cook the lentils according to directions on package (typically 20-25 minutes) and set aside while assembling ingredients. Chop lamb, roast Poblano pepper, dice vegetables and gather remaining ingredients. Heat the oil in a wide, high-sided cast iron or other heavy-bottomed pot over medium high heat. Add half of the lamb cubes and brown lightly on all sides. Remove from the pan and sprinkle with salt and pepper, then set aside. Repeat with remaining lamb cubes. Spoon the excess fat out of the pan and discard. Add the onion, garlic, carrots and peppers and cook for 3 to 4 minutes until they soften but not brown, stirring occasionally. Stir in the chile powders and cumin and cook another minute or two until fragrant. 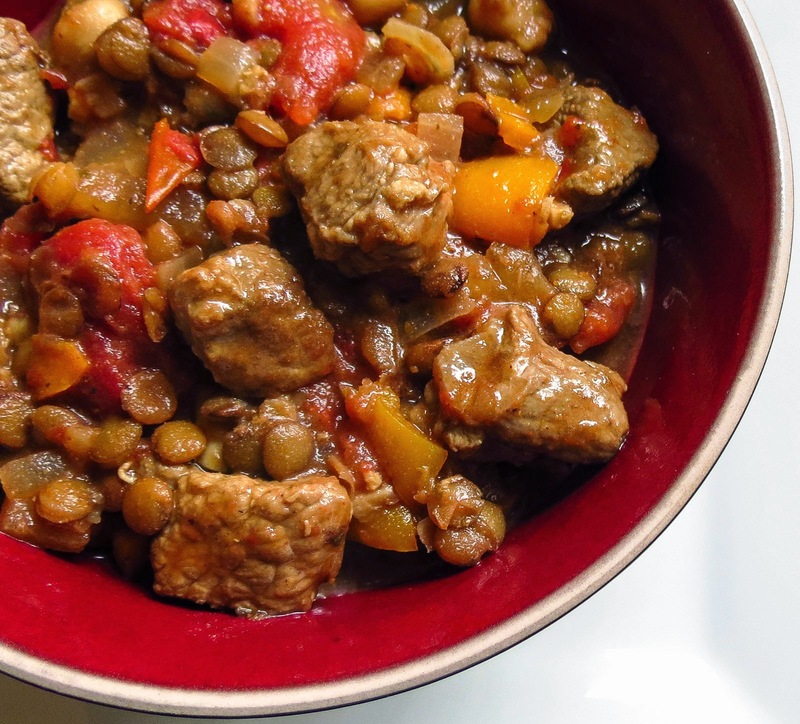 Return the lamb and any meat juices to the pan; stir to combine with the spiced vegetables. Add the diced poblano, the canned tomatoes and their juices, plus enough beef broth to cover. Bring to a slow boil and then simmer partially covered for 20-25 minutes until lamb is tender. Add more broth as needed. Add the drained lentils (and garbanzos if you choose) to the pot and continue cooking until lentils warm thoroughly and the sauce thickens a bit. Taste and adjust seasonings. Sprinkle with optional minced fresh herbs and shredded cheese and serve. The chili is tasty immediately, but will hold well in the fridge for a day or two. The lentils will soak up some of the juices so you may want to add more broth when you reheat or just enjoy the thicker sauce. Add more broth and you have a delicious soup. Cut the lamb and vegetables larger, thicken with a tablespoon of masa marina, and you have a dynamite southwestern lamb stew. I just realized that I might be a meatloaf snob. How did that happen when years ago any meatloaf was something to avoid? 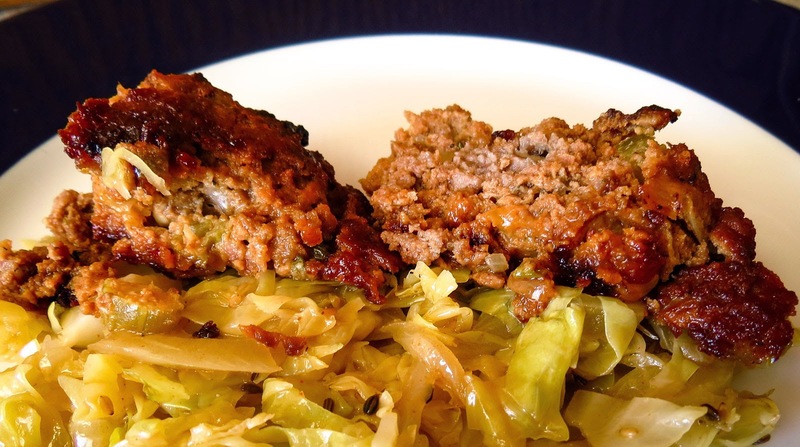 Meatloaf, "a mixture of smooshed up mystery ingredients and fat," has somehow morphed into a favorite winter entree. It may be a favorite but I am still reluctant to risk an unknown restaurant version that might be boringly bland, dry and crumbly, or horrors! greasy and edged with a pale, soggy crust. Ree's bacon-draped version is popular, but I'd rather enjoy the bacon by itself. Alton's ketchup-glazed crust doesn't tempt me. Nigella stuffs her meatloaf with hard boiled eggs and wraps it with bacon; mmmm, no thank you, that's a casserole not a meatloaf. A Marcella Rosene recipe for "Brown-Bottom Meat Loaf" (Pasta & Co. By Request, 1991), might have spoiled me for other versions. I occasionally tweak the original to reflect RL's input or what's available in the galley, but I never stray far from the original. Today's version omitted the usual minced carrots, substituted barbecue sauce for ketchup and swapped milk for half and half. No drastic differences here, no reason to mess around with a good recipe. It's all about meatloaf's Big 3: the flavor, the texture and the crust, a really crisp browned crust. A hot oven and a cast iron skillet will produce the best crust, yielding a meatloaf with a brown bottom and firm, structured sides. A quick flash under the oven broiler takes care of crisping up the top a bit. I can practice restraint when dining in public and use knife and fork plus my very best table manners, but at home I'll pinch off nibbles of crispy, browned crust, one after another. I love those crunchy edges and tend to ignore the soft, flavorful middle - at least until I visualize a sandwich. A cold meatloaf sandwich with an inch-thick slice of meat, slathered with grainy yellow mustard and creamy horseradish, topped with dill pickle slices and layered between dark rye bread, just might be more satisfying than a generous serving of meatloaf fresh from the oven. Maybe. It's a close contest. 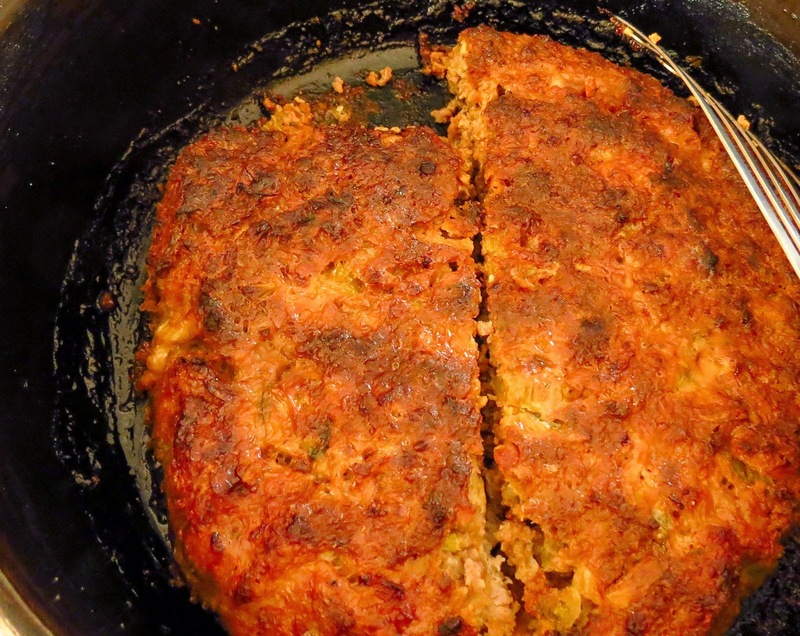 Tonight, mindful of portion control, I covered my small plate with a mound of stir-fried cabbage with onion and fennel seed, plus two puny chunks of delicious, well-seasoned, crispy-crusted meatloaf. Such restraint... RL went for seconds. Now I'll dream about cold meatloaf sandwiches until lunchtime tomorrow. Soften the diced onion, pepper, celery and garlic in a covered dish in the microwave OR in the skillet with a bit of butter. Remove and let cool. In large bowl, beat together thoroughly the eggs, barbecue sauce, milk, cumin, salt, black pepper, chipotle powder, smoked paprika and nutmeg. Add beef, pork sausage & bread crumbs. Knead together by hand until well incorporated. Add the cooled vegetable mixture and blend thoroughly. Either way, bake on a center oven rack at 375 degrees F. for 50 to 55 minutes, or until cooked through and the drippings run clear. When meat loaf is done, remove from oven and drain off the drippings. I like to return the skillet to the oven, move the rack up to the upper third and broil the meatloaf for a minute or two until the top crisps up a bit (optional). Let stand for several minutes to firm up. Slice wedges or divide in half and slice off straight pieces from center to edge. Serve and enjoy. 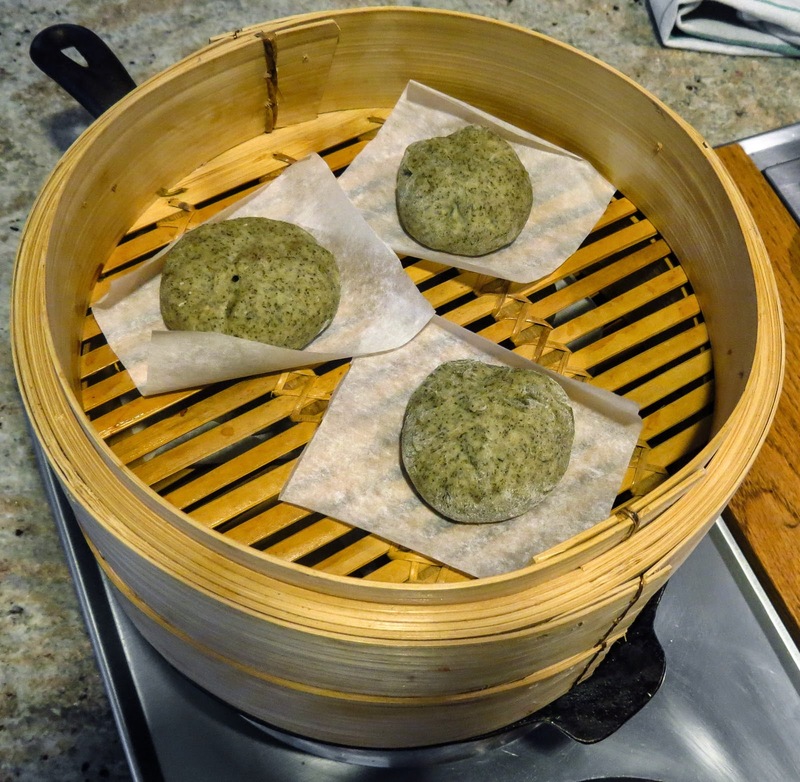 The January topic for Sourdough Surprises is Bao, those filled and fluffy steamed buns that are often found on dim sum carts in Chinese restaurants. Years ago I baked some tasty Char Sui Bao (BBQ pork filled buns) for a Daring Cooks challenge, but for some reason never did revisit that recipe. Here was an opportunity to try again, to tweak the previous Bao recipe a bit by relying solely on my sourdough starter for the rise and steaming the buns instead of baking them. 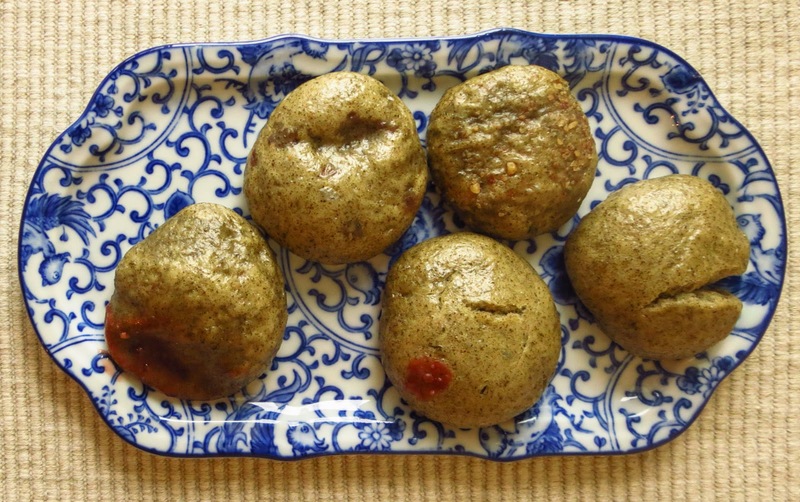 The change list expanded after spotting an intriguing photo for Green Tea Bao with Sweet Filling (here). 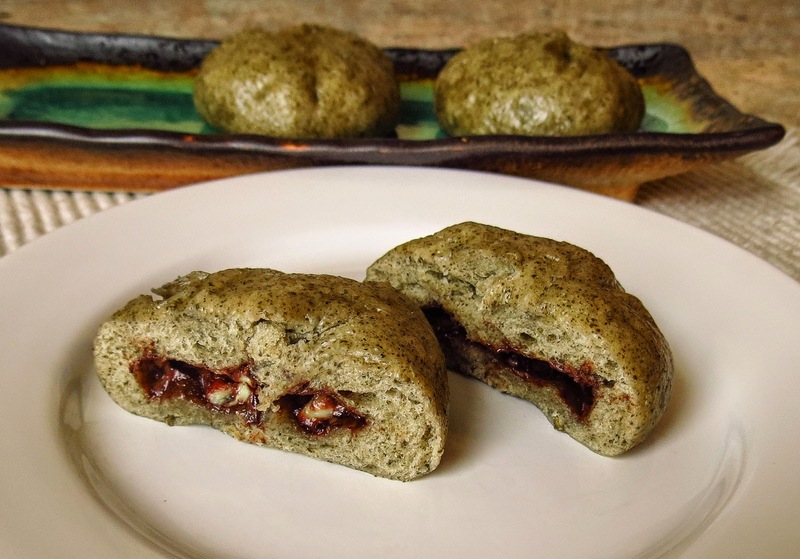 Matcha powder? That was an unfamiliar ingredient, but several online sources mentioned grinding green tea leaves to substitute for the commercial product. I could do that. Instead of driving to Uwajimaya's I grabbed an old coffee grinder, a metal sieve and a canister of loose green tea for my DIY version of matcha. Sweet sourdough buns suggested a sweet filling, sweet but not so sweet as to overwhelm the tea taste. Flavor pairings suggested online included citrus, dark chocolate, nuts, various berries and mint. I pulled Nutella, minty dark chocolate chips, raspberry preserves, coconut shreds and ground walnuts out of the pantry to try different combinations. My starter was frothy and peppy but the oddly colored Bao dough rose very slowly overnight on its first rise. I began to have doubts: should I have added some commercial yeast, or at least tossed in a bit of baking powder? Too late to worry, just press on. The dough was agreeable to work with, forming balls and rolling out easily. My pleating and pinching technique improved as I worked, and only the raspberry/ground walnut filling showed any signs of leakage later as the buns steamed. The second rise was nearly a non-event. I grew so impatient waiting for a doubling in size and finally moved on to steaming the buns. I rationalized "they are sweet dessert morsels, small will be just fine. Maybe they'll fluff and expand more as they steam... maybe... if I didn't rush them too early." Mixed reviews on the fluff factor! The buns did increase in size as they cooked but never matched the desired light airiness of restaurant Bao. The texture was pleasant enough to enjoy whether served directly from the steamer or cooled and eaten hours later. Dark Chocolate Mint Morsels scored my vote for best chocolatey filling, sweet but masking any green tea or sourdough flavor. Nutella with coconut shreds came in last place, somewhat flat tasting and definitely too sweet to play nicely with the flavors in the dough. 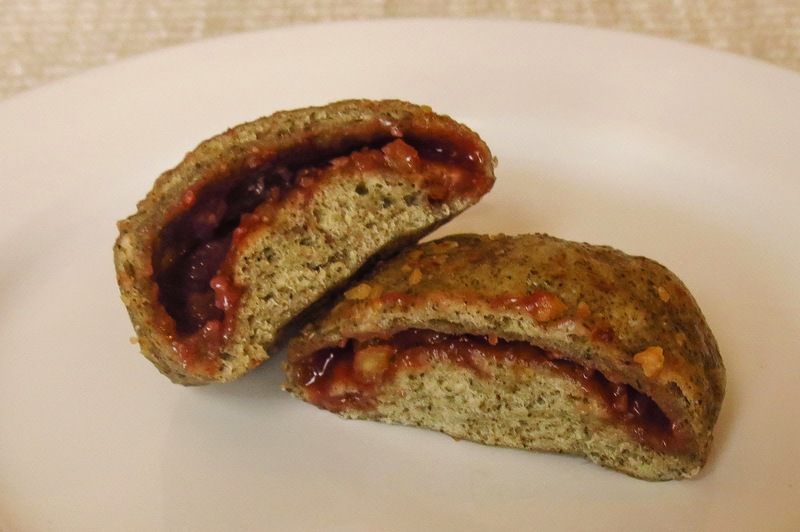 RL awarded top marks to the raspberry and ground walnut filling, but it had some disappointing leakage issues while steaming. I steamed the two remaining ping pong sized balls of dough without rolling and filling, an experiment to test the dough's texture and taste without the distraction of filling. At first bite a definite sourdough tang was apparent but I couldn't distinguish any green tea flavor. Evidently my DIY grinding of green tea leaves didn't come close to matching authentic matcha powder's taste or coloration. No problem, for consolation I ate the two unfilled buns with a bit of butter and quite enjoyed them. Now I am looking forward to checking out the posts from other Sourdough Surprises Bao bakers. Place the sugar and warm water in a small bowl; mix until sugar dissolves. Add sourdough starter and whisk to incorporate. Sift flour into a larger bowl. Add starter mixture, egg, oil, salt and Matcha powder; stir to mix. Use your hands to bring the flour mixture together. Place in a lightly oiled bowl; cover with a damp cloth and leave to rise until doubled in size. This could take several hours to overnight depending on your starter. Once dough has doubled in size, punch down and divide into 6 portions; shape into round balls. Use a rolling pin to roll a ball into a 2-inch disk. 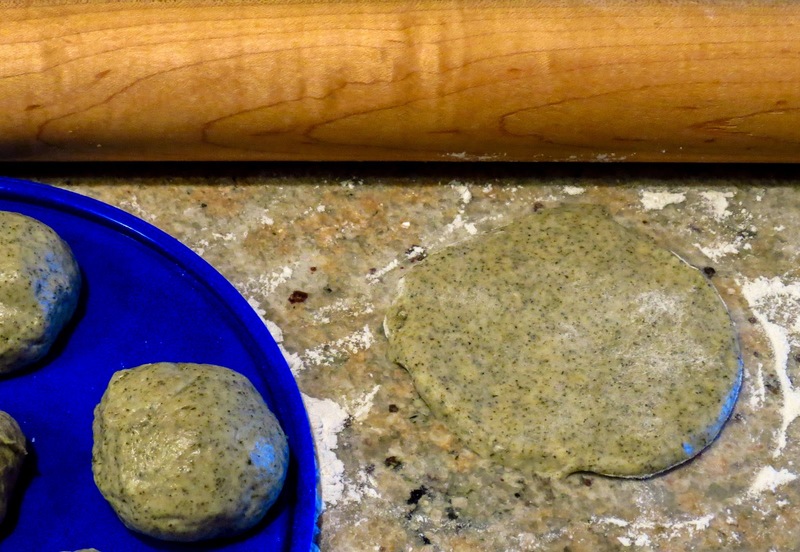 Then pick up the piece of dough and gently pull the edges to enlarge to a 3-inch diameter disk. The dough should be slightly thicker in the center. Place the bun, seal side down, on a baking tray atop a square of parchment paper. Cover with a cloth and continue with the rest of the dough. Let the buns rise until doubled in size. Remove the towel. Carefully place some of the buns (still resting on their parchment paper squares) in a steamer basket, positioning them several inches apart to allow for spreading. Place in a steamer for 10-15 minutes or until the dough is cooked through. That has been the case lately as we enjoy crowd-sized pots of soups, stews and chilies. It seems I am incapable of preparing these favorite dishes in small batches, creating "The Leftover Challenge". It gets boring eating the same thing meal after meal, so the still delicious leftovers make repeat appearances disguised creatively presented in different recipes. This week it has been all about green things, but I'm not talking about a pile of iceberg lettuce salad greens. 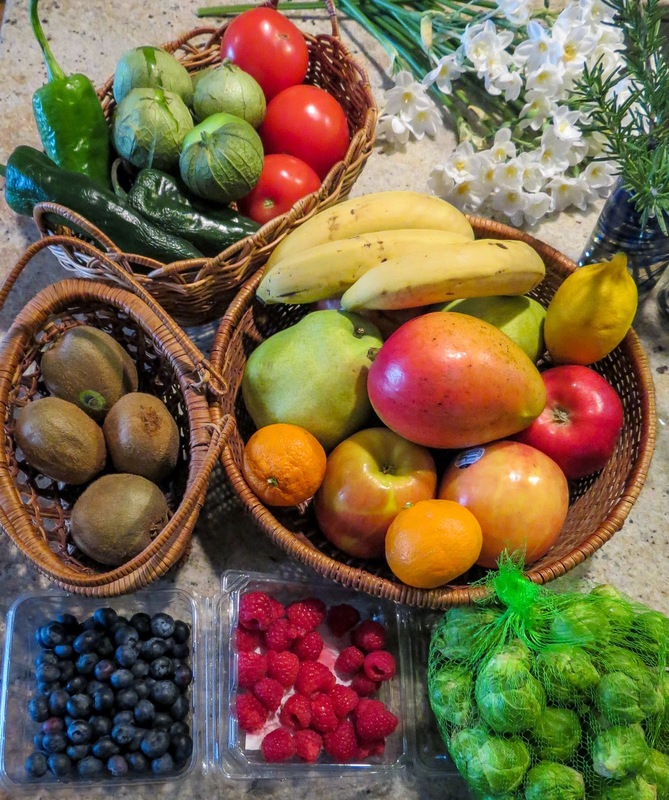 Oh no, during Seattle's cool winter weather it's more like a craving for all-things-Southwest green things; things like poblano or Anaheim or jalapeño chiles, tomatillos, cilantro, nopales, etc. that bring a little heat and virtual sunshine to the kitchen. This dish began with a Roasted Poblano, Jalapeño, Onion and Tomatillo Sauce, incorporating the usual ingredients and method. Oh my! this batch of sauce was powerful, a little peppier than planned, so I vowed to use it carefully, adding it gradually to another dish. 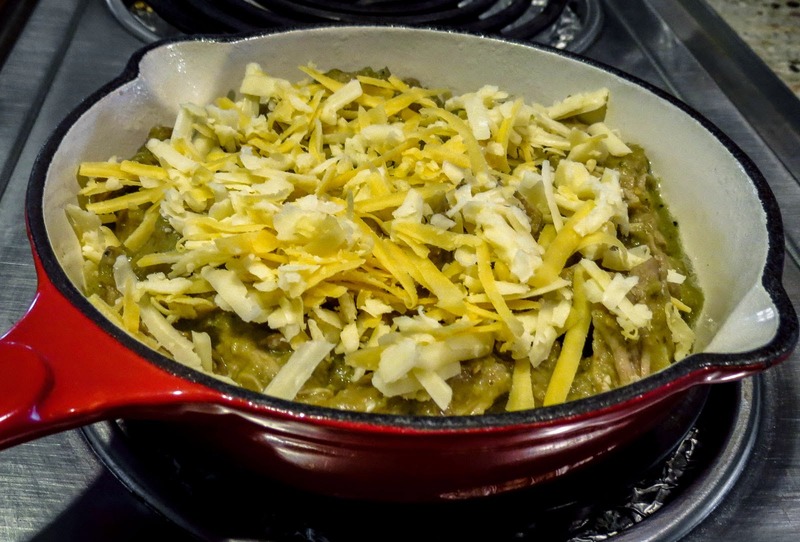 The sauce led to a big pot of Chili Verde simmering on the stovetop; tender chunks of pork smothered in that tangy, zesty, tastebud-tingling, green chili sauce. I did thin the sauce a bit with chicken broth and finished it with dollops of Mexican crema to ease the chili bite. 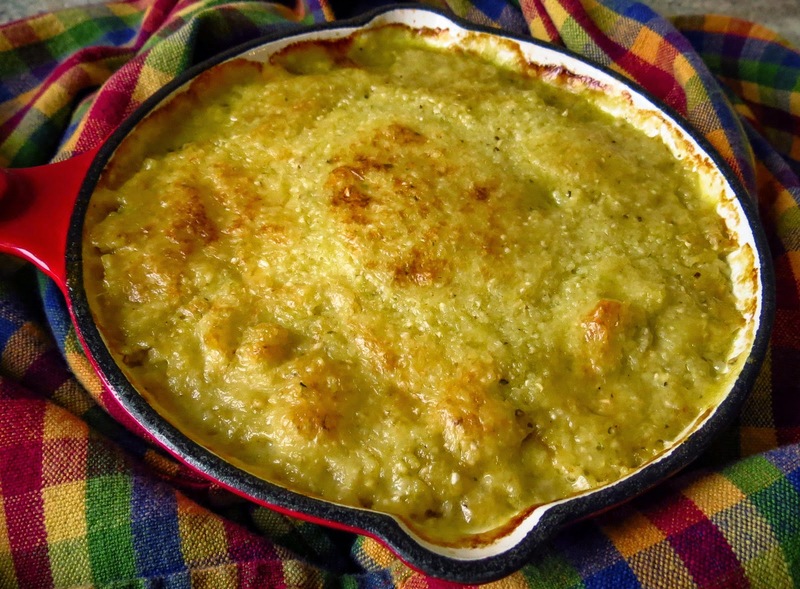 The sauce was an amazing addition to a pan of Cheese Grits. Why did it take me so long to pair these ingredients? 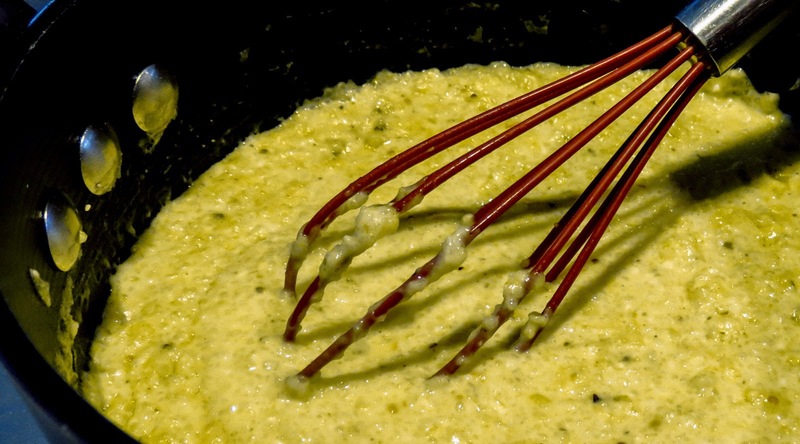 I sampled many spoonfuls of green sauced cheese grits before plating any for dinner. These grits were even terrific cold, straight from the fridge during a late night snack raid. And there were still grits leftover. Do you see this dish developing? Ahem! did I mention this was a big pot of chili? Chili Verde is good on day 1, even better on day 2, and then you still have leftovers to work with or freeze. 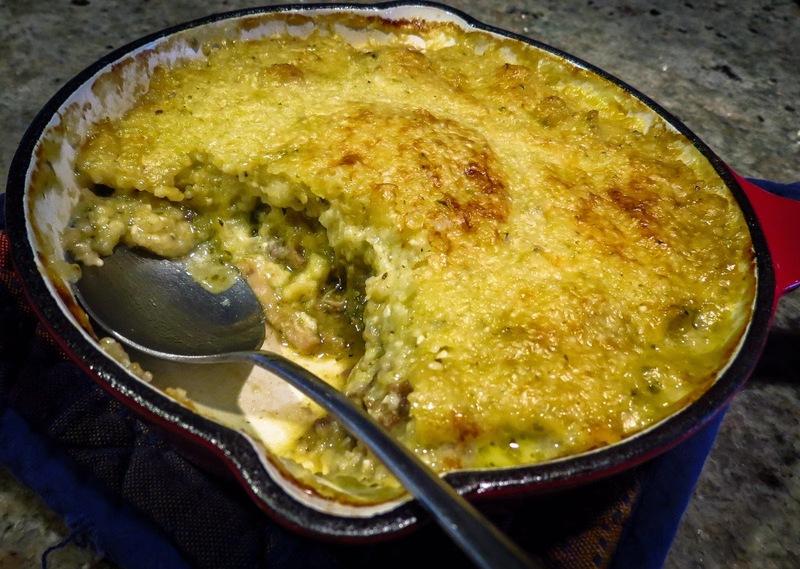 Today's winning option was a riff on Tamale Pie, a peppy Poblano Pork Chili version sprinkled with grated white and yellow cheddar cheeses and topped with Cheesy Green Sauce Grits. The grits alone were pure heaven on a spoon! While this dish is not a traditional tamale pie, it is packed with Southwest flavor. We finished all of the leftover Chili Verde and Green Sauced Cheese Grits, but one container of that peppy green sauce still remains. Hmmm, I'm dreaming of green sauced omelets, tacos, enchiladas, pulled pork sandwiches... Yum! Remove the papery husks from the tomatillos and wash to remove sticky residue. Cut the onion in half. Line a baking sheet with foil. 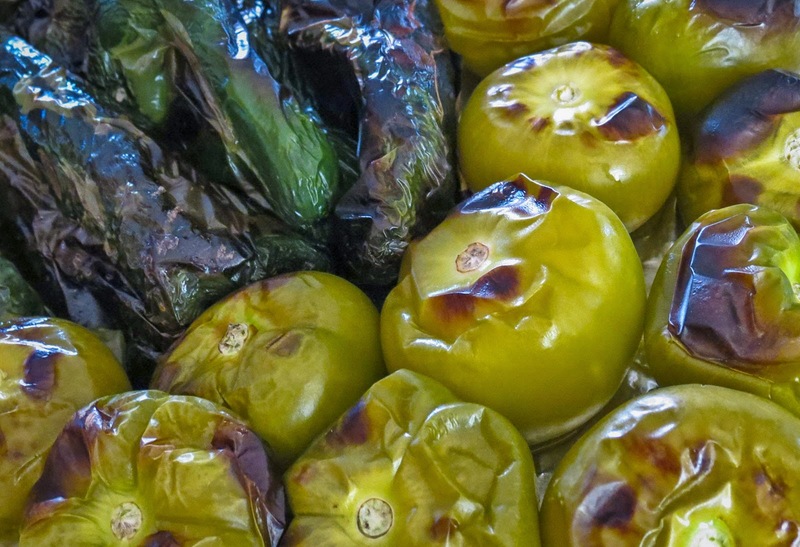 Arrange the chile peppers, tomatillos and onion halves on the foil in one layer. Broil until peppers blister and the tomatillos and onion brown; turn and continue on remaining side(s). Remove from the oven and cool. Peel charred skin from peppers. Remove seeds and veins, retaining any juices. Add onions, tomatillos, garlic, peeled peppers, any accumulated juices and cilantro to a blender jar. Cover and pulse to blend. Transfer to a pan or skillet and simmer over medium-low heat to reduce and thicken to desired consistency. Add salt, pepper and optional lime to taste. 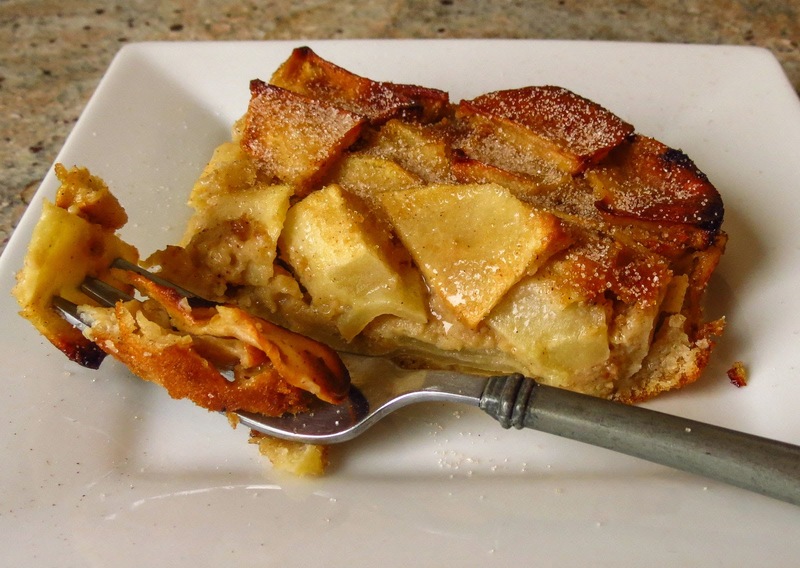 Are you looking for one more simple apple dessert? I wasn't, but when Serious Eats featured this apple cake in a review of Dorie Greenspan's latest cookbook, Baking Chez Moi, I had to try it. 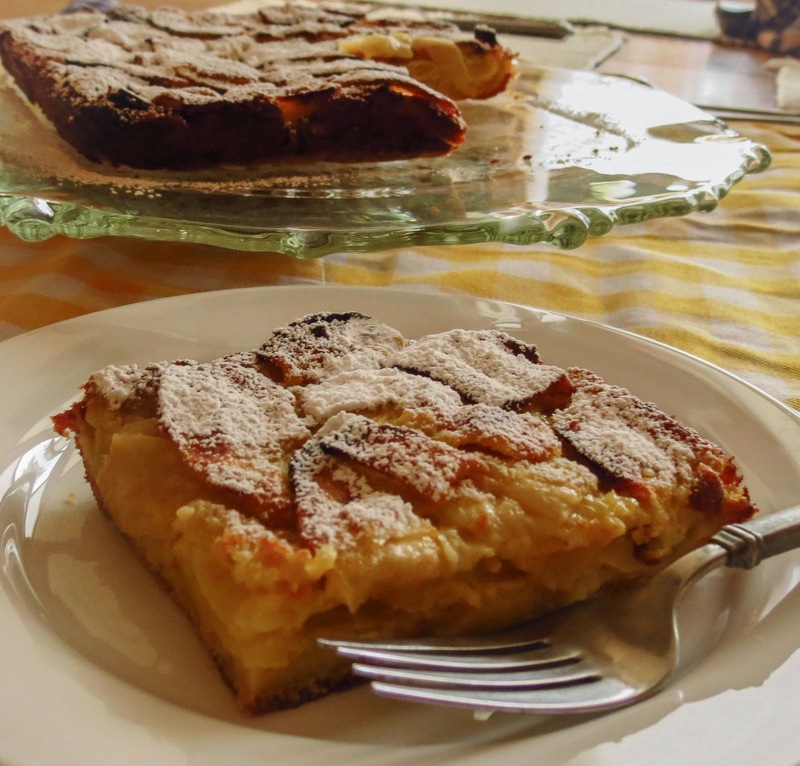 Dorie is an iconic culinary guru, so I expected a lot from these custardy apple squares. We are already huge fans of most sweet appley treats. One of our favorite desserts, Apple Cheese Torte, involves cinnamon-spiced apples bathed in a cream cheese custardlike filling and snuggled inside a buttery shortbread crust. While superbly delicious it's more of a company dessert, so I don't often bake it. Quick Apple Crostata is more of a family dessert and takes mere minutes from prep to finish... if I first remember to thaw a frozen package of pie crusts. Cinnamon Apple Crepes and Apple Pie Swedish Pancakes serve equally well as delicious dessert or breakfast fare. Orange-Spiced Apple Rolls and Apple and Nut Coffee Cake win top honors on any brunch menu. Both Fresh Apple Quick Bread and Appl-icious Brown Bread are snackable hits. Apple and Jalapeño Pie with a Pecan Crust is amazing - note to self to share that recipe. 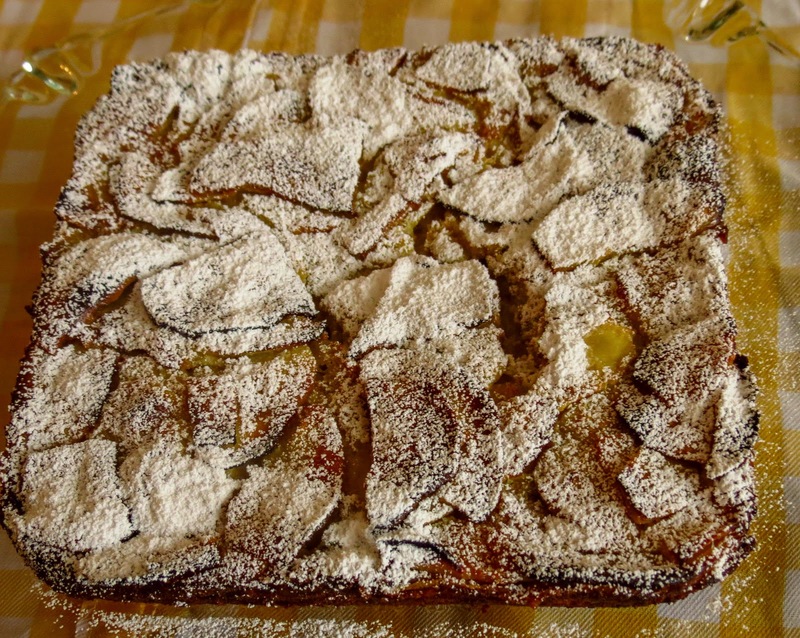 Enough already, back to Dorie's apple cake recipe. So why did I try one more apple dessert recipe? Well, it sounded sweet and appley, almost a cake and not quite a custard... and Dorie Greenspan created it. It must be might be terrific. Peeling, slicing, measuring and mixing took less than ten minutes, almost too quick since I had to wait several more minutes for the oven to come up to temperature. While the cake baked its heavenly aroma kept me in the kitchen, nose twitching like a hound on the scent, and lured RL away from his computer project. Ooooh, we were so ready to love this cake. Baking timing was a challenge; the outer edge browned heavily before the center puffed and firmed. Was my glass baking pan the cause? should I drop the temperature 25 degrees F next time to compensate for a glass pan, or purchase a metal pan? should I switch to a round cake pan to avoid crispy corners altogether? Despite the firm, dark brown edges, the cake showed promise. A dusting of powdered sugar improved the overall appearance and the first bite proved... pleasant. Hmmm, could the smell of an apple square actually outperform the taste?! I had already tweaked the original recipe by adding a generous tablespoon of freshly grated lemon zest, but felt it needed more of a flavor boost. RL declared it was just fine as is, and ate another piece... and another. We did enjoy this apple cake, ate the entire thing within the day, and pronounced it good but not quite as terrific as the Serious Eats post had proclaimed. Did I expect too much from a simple recipe? Maybe so, but I'm ready to give it another try. Next time I might add some cardamom or Apple Pie Spice, or stir in a teaspoon of almond extract, or even swap some pears for the apples (as suggested in some SeriousEats and FaceBook comments). A cook can't have too many "apple something" recipes. 1. Dropping the oven temperature 25 degrees F in a later batch eliminated the over browned edges and apple tips. The glass 8x8 pan must have been the issue on the first batch. 2. Additional flavorings - cardamom, apple pie spice and almond extract - helped boost the flavor, but the tastiest change was swapping a cinnamon/sugar topping for the original powdered sugar. 3. RL requested another pan of this cake today. He apparently loves it while I want it to tweak it to be something different, something more... I don't know what. Evidently it's still a work in progress. Place a rack in the center of the oven; preheat to 400 degrees F.
Butter or spray an 8-inch square baking pan and line the bottom with parchment paper. Slice the apples quite thin, about 1/16 th inch thin, " elegantly thin, but not so thin that they’re transparent and fragile." Discard the cores. Use a small bowl and whisk together the flour and baking powder. In a large, separate bowl whisk the eggs, sugar and salt together for about 2 minutes, until the sugar just about dissolves and the eggs are pale. Whisk in the vanilla, then the milk and finally the melted butter. Add the flour to the bowl and whisk until smooth. Add the apples and using a rubber or silicone spatula gently fold the apples into the batter, turning until each thin slice is coated in batter. Scrape the batter into the pan and smooth out the top. Bake for 40 to 50 minutes, until golden brown, uniformly puffed. Check to be sure the middle of the cake has risen and a knife inserted into the center comes out clean. Remove from the oven and place on a cooling rack; allow to cool and set up for at least 15 minutes. Unmold the cake bottom-side-up onto a plate, flip it back onto a second plate and cut into squares. Dust with powdered sugar; cut and serve. and welcome to my kitchen. 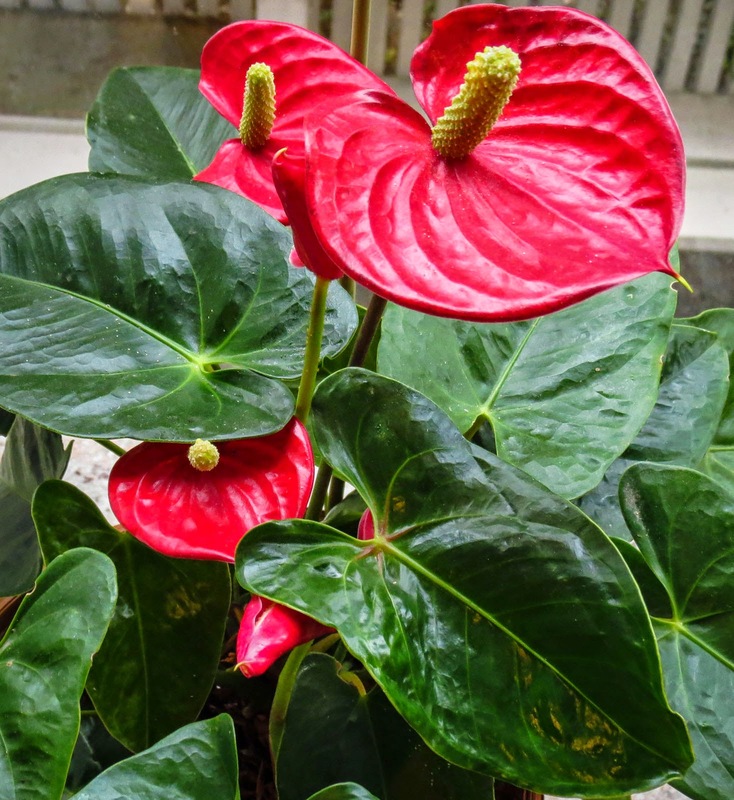 Two enthusiastic anthurium celebrate the New Year in the window bay by opening new flower buds; bright spots of color that provide a tropical contrast to our cool and stormy Pacific NorthWest weather. Currently sunrise arrives around 8 a.m. and sunset is scheduled near 4:30 p.m., though the afternoons seem masked with a misty gray filter. During these shortened days I really appreciate the plants' glow and constant indoor cheer. We finished the last of the Christmas cookies, candy and Mango and Peach Mini Bundt Cakes; their tempting presence has been replaced by an inviting array of fruits and vegetables. Other produce like tender baby bok choy, kale, carrots, cucumbers, broccoli, ginger, fresh herbs and salad greens are hanging out in the fridge. I look forward to some healthy salads, salsas, sauces and stir fry opportunities. 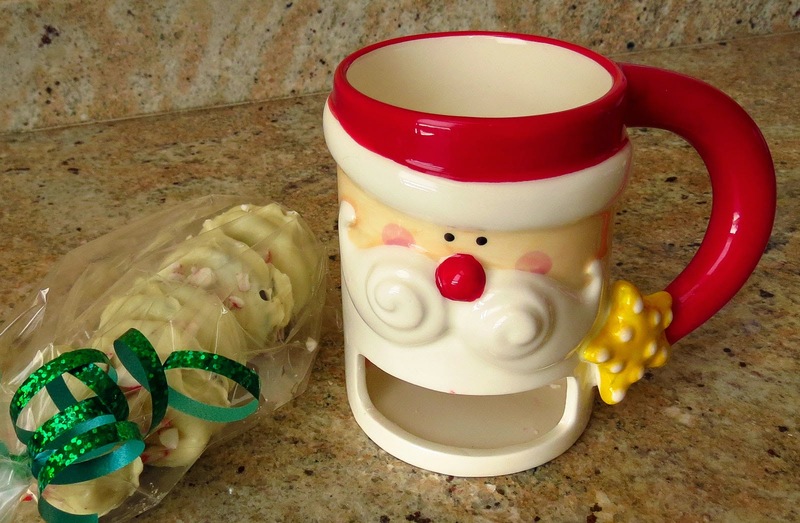 ...RL's charming Santa mug gift from Hilary. Notice the handy opening designed to hold cookies, plus the accompanying flavor-popping, vanilla-frosted, peppermint-sprinkled Oreo cookies. The mug works best if you are left handed: go ahead, ask me how I know this detail. 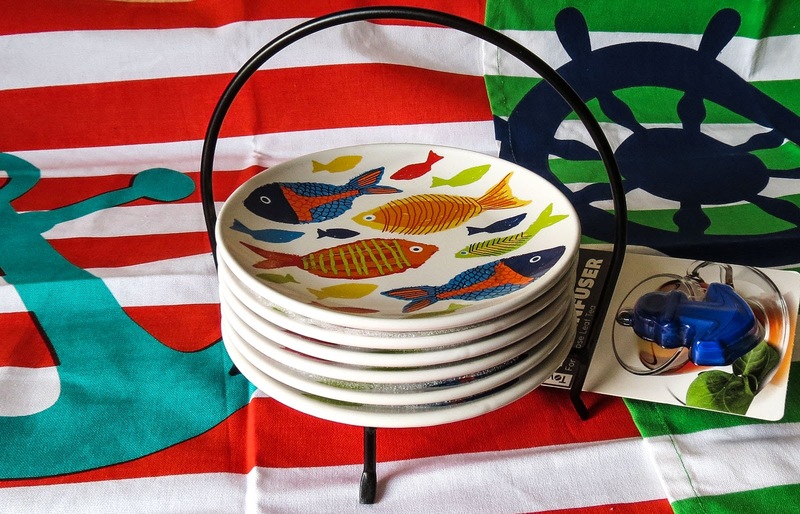 ...my nautical-themed package of brightly-colored tea towels, charming fish snack plates with carrier, and practical anchor-shaped tea infuser. These will add a pop of color to the boat galley. ...a U.S.-produced six-pack of tangy apple cider delivered by Laci. Eons ago I fell in love with Canadian hard cider, a refreshing alcoholic beverage that can pack a sneaky wallop if you drink it like a soft drink. Unable to find a comparable product in the U.S. I confined my cider-drinking to our summer trips. All that has changed and hard cider is now a fast-growing U.S. alcoholic beverage component. 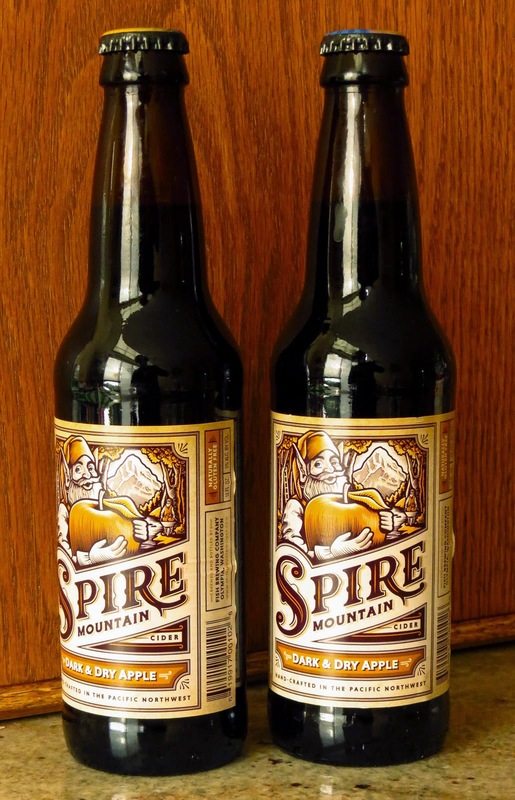 (link) Today craft breweries abound, hooray!! Rumor has it that a family member is aging her first batch of pear cider; I volunteered to taste test. 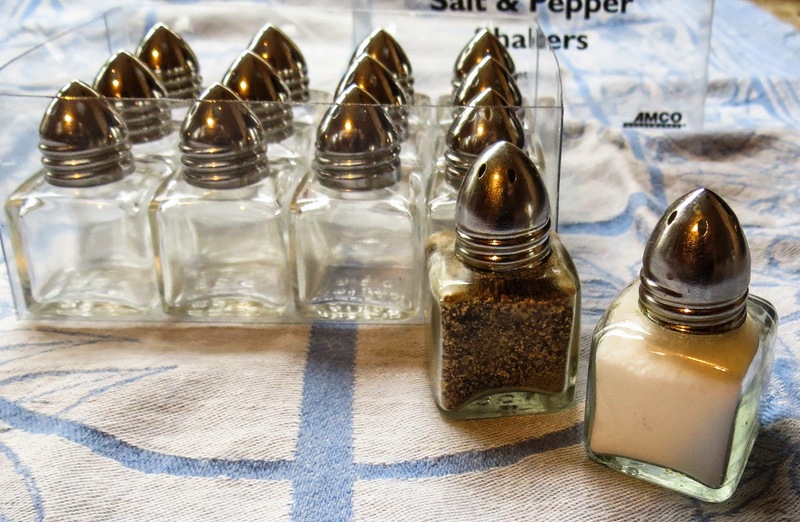 While organizing kitchen drawers I rediscovered an unused box of individual salt and pepper shakers, neatly tucked away with my stash of white linen napkins. I wonder if these cuties will ever get any use if the electric grinders are available. Why are they still in the kitchen? I haven't hosted a large-group dinner party in ages, but rationalize that the glass shakers don't take up much storage space. Did I intend them as photo props? or do I just like owning them? Flavored salt has earned more shelf space in the spice cabinet, joining the various smoked paprikas. 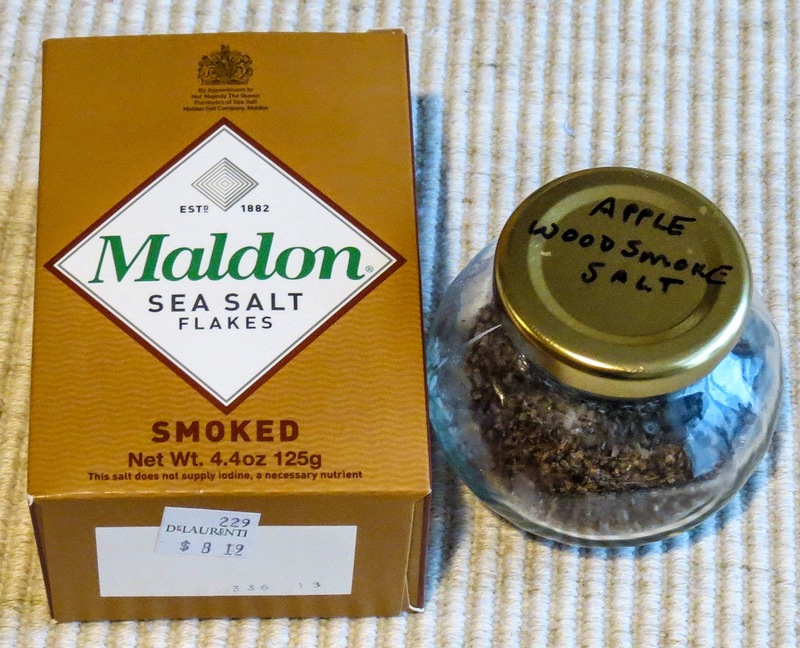 We both love smoked salt as a finishing seasoning; just a pinch provides such a big flavor pop. Hmmm, charcoal grill-smoked salt could be an interesting, warm weather DIY project later this year. ...and that's a little bit of what's in my kitchen. Each month Celia of Fig Jam and Lime Cordial invites bloggers to share posts about what's in their kitchen. I discovered Celia's blog and the IMK group last month and loved a quick peek into so many kitchens from around the world. Click over and visit some of the IMK bloggers, I think you will enjoy this fascinating international group. 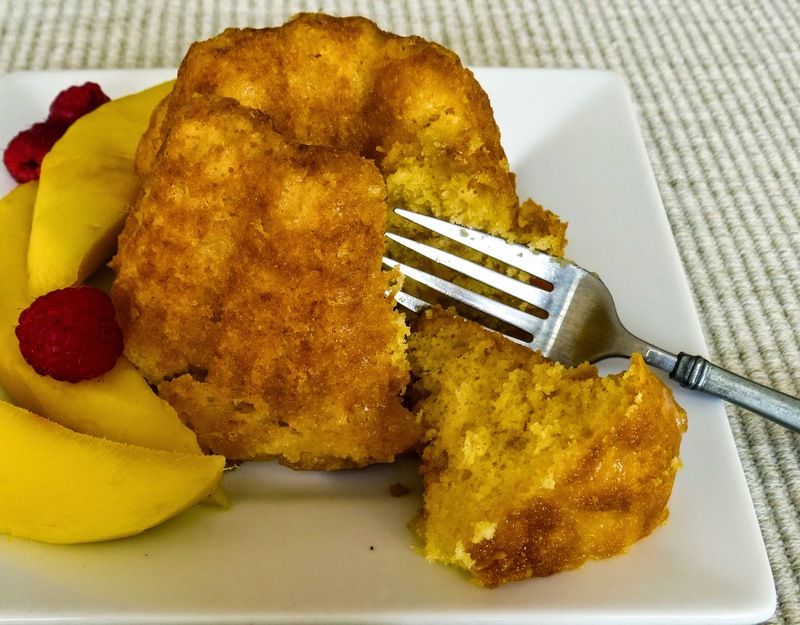 Photo: bundt cake for brunch - oh, yes please! Here it is, the first week of the new year, a time to focus on healthy eating, renewed exercise and all of the usual resolutions... eventually. But first I had to bake this sweet dessert treat for us to enjoy with Hilary at one last holiday celebration. Isn't there a rule somewhere that dictates gooey desserts at Christmas?! An ordinary yellow box mix cake was transformed by a 3-ounce package of mango pudding mix and a cup of Peach Schnapps. The first bite of this tropical delight was definitely boozy, but in a good way. Mango and peach flavors registered but were subtle, the drizzled glaze was sweet but not cloying. After that first taste we decided to forgo freshly whipped cream and enjoy the mini cakes plain; they were just that satisfying. There was a small process problem during the baking: too much batter in each cup. "Never apologize, just carry on" ran through my head as I watched the batter overrunning each of the six mini bundt cups in the oven. (Note to self: evidently the recipe for 1 large bundt cake is sufficient for 7 or more mini cakes). Oops! It's a good thing I had a cookie sheet under the bundt pan to catch any overflow and save me from a messy oven cleanup. Each little cake sported a wide muffin-top (which ended up as its base) that was crunchy. I neatly trimmed the overhanging edges and used a skewer to poke holes in those crusty tops to encourage syrup absorption; it worked. I had planned to serve three cakes and freeze the remaining three for future desserts. Hil and I split a cake, and that left four irresistible little treats... that never made it to the freezer. Midnight snacks and late morning nibbles polished them off. How does that happen so quickly? Christmas cookies are gone, the "good" chocolate is finished and the Boozy Mango Peach Mini Bundt Cakes are just a memory. It might be time to return to healthier eating, fresh fruit desserts for example, but I don't regret one delicious bite of any of them. Oil or spray with cooking spray each cup in a 6-cup mini bundt pan. There will be enough batter to fill additional muffin tins or mini loaf pans. Mix all ingredients together, spoon or ladle into prepared pans, filling each cup 3/4 full, and bake in a preheated oven as directed on cake package. Use a cake tester to check "doneness"; no crumbs should adhere to the poker. Bring butter, water and sugar to boil; stir until sugar dissolves. Remove from heat to add Schnapps (it's a safety issue). Pour the glaze over cakes while still warm from the oven. Slowly spoon about half of the glaze over the cakes while still resting in pan. Then invert the cakes onto a large, flat plate or cookie sheet and slowly add the rest of the glaze. Cool the cakes and serve at room temperature. Or wrap and freeze to hold for future use.